A unique way to experience China is on a cruise ship. For whatever reason, there aren’t tons of cruises that will take you along China’s coast and into here inland. 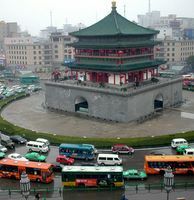 One that does and that looks especially interesting is Avalon Waterways’ 11-day China cruise. It starts in the booming city of Shanghai and takes you along the Yangtze River to the Three Gorges Dam. The largest dam in the world, the Three Gorges Dam will be completed in 2009 and will span over a mile in length. From there the journey continues to the eternal city of Xian which will give you a feel for what China was like before modern times. The last stop in Beijing, home of the 2008 Summer Olympics and a city that has fascinated visitors for centuries.